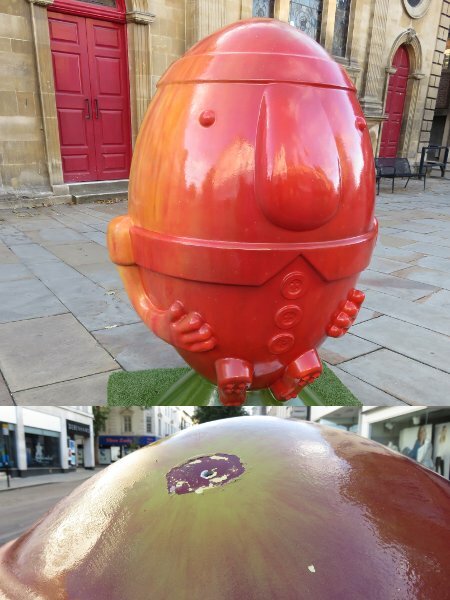 In celebration of hosting some world cup rugby matches, and because sculpture trails seem to be the in thing at the moment, Gloucester currently has a Scrumpty trail of 20 statues dotted around the city centre - plus mini versions in shop windows. 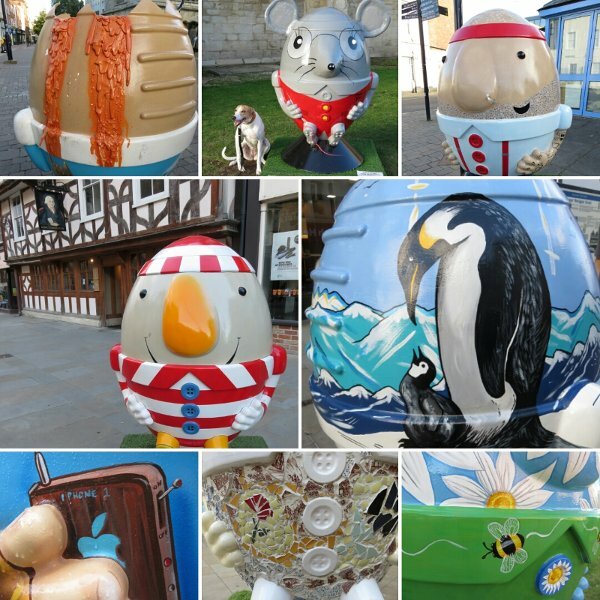 Some of the Scrumpties (I note with disgust that the official website pluralises with an apostrophe - "Scrumpty's" - yuck!) 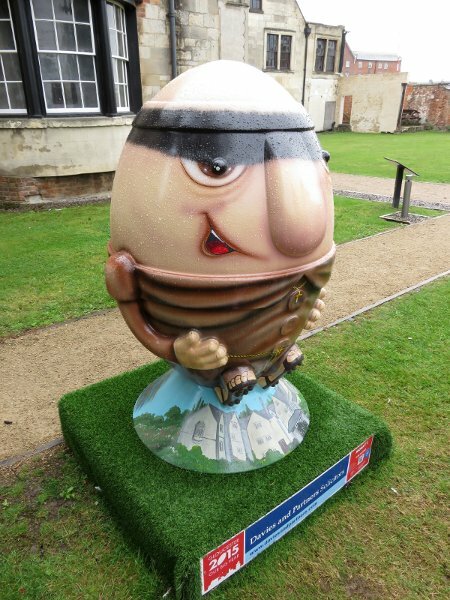 are rugby themed, some are local themed, some seem to have no obvious link to anything but are very pretty, and one is actually a bit terrifying. The map suggests the Monkty (on the left, below) is near the main road, but actually he's standing outside Blackfriar's priory. A much more fitting location - though I believe his inspiration is nearby Prinknash Abbey. 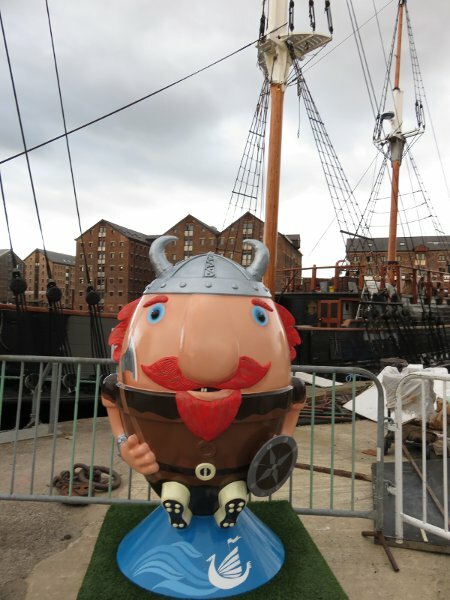 The Viking looks quite at home in the docks next to whatever tall ship is in there at the moment, and is one of my favourites. Others are less exciting. Sadly a few have been damaged- the Mouse (from the Tailor of Gloucester) has been fixed after having an ear ripped off, and 'Cracked' (top left in my collage) should have a spoon sticking out of it. Scrumpy here is missing a stalk, so just looks like a red blob rather than the apple it's supposed to be. Shame. Minor vandalism aside, I enjoyed finding them all. Being local I wander around town fairly often, so it's a nice change to have something new to look at!